“I’m just being realistic.” – Too many people talking to themselves (or others). “I hear what you’re saying, but how about you try to be more realistic?” – So many people you know, speaking to you. Oh, the number of times I’ve heard some version of these phrases used in conversation. The ask someone makes of us – or most often, that WE make of ourselves: to be realistic. For most people – especially entrepreneurs, big dreamers, and creators of any kind – it’s a phrase we may encounter multiple times throughout the week, whether it be from someone else, or from our own minds and self-made (not to be confused with self-serving) belief systems. Recently, while on a long drive I realized: I’m over that phrase. Instead, I decided to write you a quick note of encouragement that asks you to stop being realistic! Now let’s discuss the problem that often occurs when you’re realistic: More often than not when we think we’re being realistic, or someone looking into and projecting onto our lives, dreams, and business is telling us to be realistic, something else is happening. All of these nudges from ourselves or others towards being “realistic” lead to us to begin doing less and thinking less of ourselves and what we have to offer the world, personally and professionally. We stay inside of our realistic comfort zone. We mimic what others do because they’re being sensible, or so we think. We color inside the lines. We pull back from risks. We lower our prices. We forget our value. We stop taking chances. This is also a dangerous path to head down because the “realistic barometer” that you are measuring your actions, risks, and dreams with is measured by someone else’s definition of the concept, which they’re projecting onto you. Take a moment to let that sink in! Whose version of realistic are you following in the first place? If each person’s perception is their own reality, based on their own life experiences, self-made belief systems, and future goals and dreams, are you really comfortable attaching your own life and happiness to what others think is pragmatic and sensible? To continue that thought, if your own reality is rooted in belief systems that may or may not be serving you fully, and you’re working to figure that out and build a bigger and better life, don’t you think you should examine yourself and your thoughts from time-to-time when you are tempted to pull back from potentially big opportunities, big asks, or setting big goals, because you don’t think they’re realistic? I encounter the same, limiting beliefs regarding what is considered to be realistic or possible almost daily in terms of small businesses and entrepreneurs pursuing publicity and buzz for their businesses. Nearly every business owner I speak with about their public relations goals is already thinking too small. They don’t think they are capable of – or deserve -landing impactful local or national press. They don’t reach out to editors who can boost their visibility and change their business, and for that reason alone, they never experience these business-changing opportunities. All because they told themselves it wasn’t realistic! “AHHHHHHH!” – Me, in my head, reflecting on this. That’s not an ideal way to begin, and when we start that way, we often continue thinking that way; a mindset that isn’t going to get you where you need and desire to be in work and life. Does this limit that being realistic creates sound familiar? Don’t feel bad, it’s a common trait shared by most of us. It’s been taught to you – even by those who want to love and protect you – since you were young. It’s probably been repeated in workplaces you’ve been a part of, and in your head and heart as you plan and push to build whatever it is you want to create, work for, or focus your time and energy on. But it doesn’t have to be the way you continue living and working, starting now! How do you begin living bigger and less realistically? I believe the first simple yet immensely powerful step is to do what we’re doing right now. You acknowledge the “curse of being realistic” and you decide – to borrow a phrase from my childhood – to “check yourself before you wreck yourself”. You remember that you’re needed to think bigger and show up more – really show up – because your business needs you to, your family needs you to, your colleagues looking to you for inspiration need you to, and in many ways, the world needs you to! Showing up and thinking bigger will mean different things to different people. It could mean showing up at networking events, showing up on social media, posting your first video on Instastory or mentally showing up for to-do list instead of hiding from the goals that appear the most challenging. It could simply mean being present and aware of what’s happening in your life and your work so that you can honestly assess how it’s going and what you can do to can improve it. When I ask you to stop being so realistic I’m asking you to think and dream bigger, and that’s not all…We need you to act bigger. Live bigger. Grow bigger. Take on challenges that are bigger than you are right now, that force you to grow – and prove to yourself that you have what it takes to expand beyond what you currently think is possible. The truth is, it’s easier to do all of that than you realize. In many ways, it just takes the commitment to take a chance and begin, so let us begin together today! Be unrealistic a little bit more my friends! You need it, your business needs it, and the rest of us need it. Realistic isn’t enough for us and it isn’t enough for you. I know you can do it, I’m here to support you while you try to make these changes, and I know you can and will. I believe in you with every unrealistic bone in my body! P.S. Want some support and hundreds of others cheering you on as you make less realistic and more life and business expanding decisions? Pop into my Facebook Community and you’ll find that there, whenever you need it! 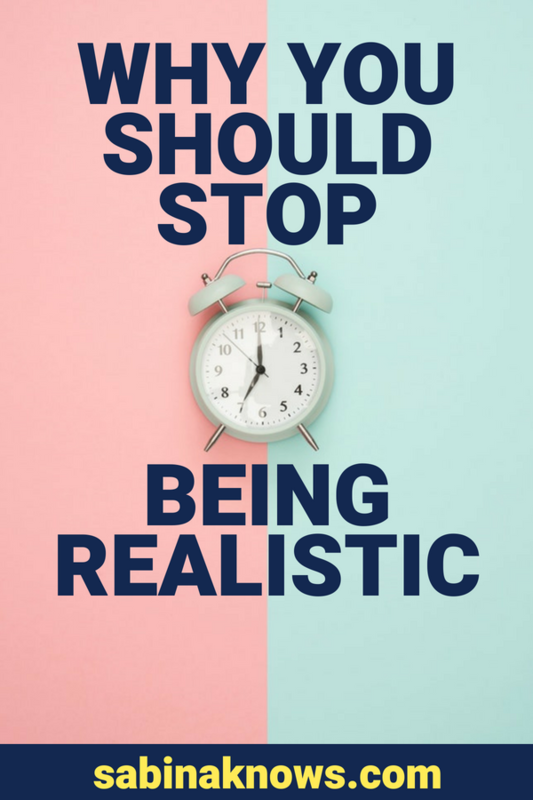 Do you think that “being realistic” has held you back in the past? How do you face down thoughts that tempt you to live or think small?